A well-designed bathroom that is spacious, practical and inspiring is something that rarely goes unnoticed. After all, as the saying goes, ‘kitchens and bathrooms sell houses’. We all know the value of a stylish bathroom which not only provides ample space to get ready in a hurry on a busy morning, but also adopts a practical design that makes it easy to store and access all the essentials. However, a bathroom is about more than just functionality—it should also provide a tranquil sanctuary where you can relax and unwind while soaking in a hot bath after a long day. 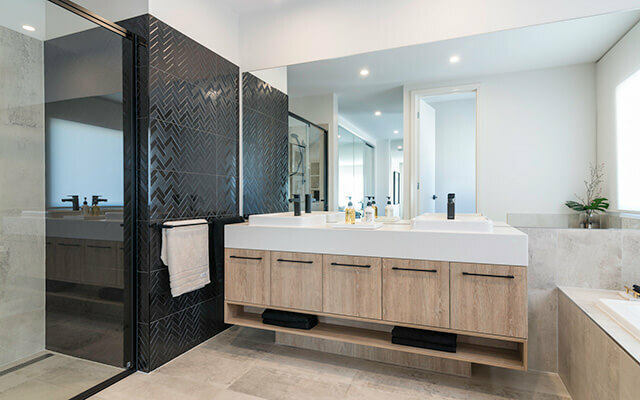 Designing the perfect bathroom that is both beautiful and practical is often easier said than done, but with a little forethought and an experienced builder like Dennis Family Homes on your side, it’s easier than you think. What goes into a bathroom? Vanity: The combination of the cabinetry, benchtop and basin is what’s known as the bathroom vanity. Cabinetry: Not only will your cabinetry provide some much-needed storage to hide away all your toiletries and other items when not in use, your cabinetry will also play a key role in the overall design of the space. Whether you opt for cupboards, drawers, open shelving or a combination of these, it’s important you find the right balance between functionality and design when selecting your cabinetry. Benchtop: As one of the wettest areas of the home, it’s integral you select a durable material for your vanity benchtops to ensure it can withstand any wear and tear and avoid water damage. Stone or Caesarstone® benchtops will provide the most durability and help elevate your bathroom to a superior level of luxury. Basin: Whether you prefer square, round or curved designs, a well-selected basin will complete your vanity to create a beautiful yet functional space. Opt for a ‘his and hers’ double basin vanity if you want that added sense of luxury. Mirror: An essential component of any bathroom (just try doing your personal grooming without one! 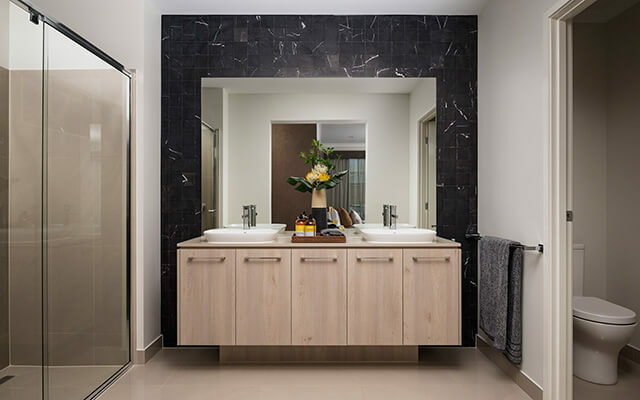 ), a mirror will help even the smallest of bathrooms feel larger and more spacious. Shower screen: Should serve a functional purpose containing water from escaping from the shower, but shouldn’t be the focus of the room. Ensure your shower screen doesn’t detract from the other key features in the space by avoiding designs with wide or obvious frames so you can achieve a more streamlined look. Tapware and Showerhead: Provides the finishing touches to the bathroom. Ensure your chosen tapware is consistent with the other fixtures, fittings and tapware used throughout the home to ensure a good flow between the bathroom and the rest of the home. Floor and wall tiles: Aside from protecting your floors and walls from wear and tear and water damage, tiling will also add to the overall aesthetics of the bathroom. You should select different tiles for your floors and walls to create some contrast in the room. Generally, it’s a good idea to adopt larger more durable tiles for flooring, while you can afford to be a little more adventurous with your wall tiles. At Dennis Family Homes, we make it easy for you to design a bathroom that is not only beautiful and functional, but also speaks to your personal sense of style. When you purchase one of our Premium Inspirations home designs, your bathroom will come complete with a superb range of inclusions like a semi-frameless polished silver shower screen, large fixed mirror with polished edges, water efficient AAA rated tapware and showerheads and your choice of individual fixture styling. During your personal colour consultation, you’ll also have the opportunity to tailor your bathroom design to suit your particular style preferences. 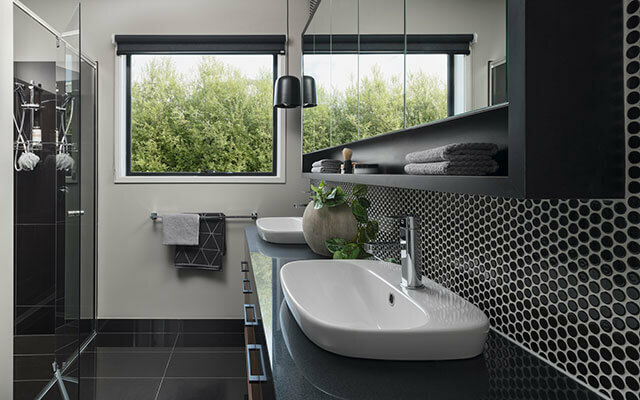 Giving you the choice between eight vanity design styles, 16 Caesarstone® benchtop colours, five contemporary basin styles and five chrome tapware and showerhead styles, you’ll have the flexibility to create the stylish bathroom you’ve always wanted. To find out more about our extensive range of bathroom design options, visit one of our Dennis display centres where you can sample some of our stylish bathroom designs first-hand and imagine some of the possibilities for your own home. **All inclusions mentioned are included when purchasing a Dennis Family Homes Premium Inspirations home design.